Unitus Ventures (formerly Unitus Seed Fund) II, LP (USF II) is a for-profit impact fund seeking to deliver market-rate returns in concert with social impact. Some foundations are directly investing their corpus funds as mission-related investments (or “MRI”) in USF II. There are relatively few IRS considerations on investing in this way. Others foundations are interested in making the investments from their annual 5% program allocations, as program related investments ( or “PRI”). Both are entirely practical. For background and useful references around both MRI and PRI investments, we first recommend reading this 2013 article from Forbes on the topic of foundation investments in for-profit mission-related entities. For a longer but still readable report on foundations and PRIs produced by Mission Investors Exchange, read here. Since USF II is a for-profit fund and each foundation has its own considerations in evaluating IRS regulations around PRI, we have taken two steps to facilitate these investments. First, we have a side letter which we can customize to address needs/concerns of each foundation. Eight leading foundations have already accepted our side letter + Private Placement Memorandum as adequate support for a PRI investment. And second, we have set up a Donor Advised Fund (DAF) mechanism with ImpactAssets to enable foundations to make an program grant to the non-profit DAF which is then invested in USF II. 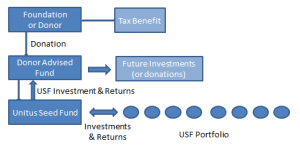 We also highly recommend fiduciaries of private foundations read the recent IRS comments which clarify their intent with respect to PRI, linked below, as the DAF is not necessary for most foundations. In April 2012, the Federal Register published a commentary from the IRS and Treasury on PRI examples.